Seventeenth Century Suffolk was not a good place to be sacramentally minded. The Reformation of a century earlier had found Suffolkers to be enthusiastic Anglicans, destroying the Catholic liturgical apparatus of their churches with energy and zeal. The Edwardian ordinances against images in the late 1540s meant that virtually all that remained visible in Suffolk was that which was inconvenient to destroy, like gable crosses and hammer beam angels, and the inconvenient to replace, like stained glass. That, however, was also doomed. A century later, a man called William Dowsing, the Commonwealth's official visitor to the Eastern Association's churches, was greeted with some enthusiasm in Suffolk, a strongly puritan, parliamentary county (except for those funny people around Lowestoft). The desire of Archbishop Laud to restore the sacramental nature of parish churches in the 1630s had met with considerable opposition here, despite (or even because of) the strong-arm tactics of the Bishop of Norwich. In short, Suffolk warmed to Protestantism. But there were pockets where the faithful saw beyond the confines of the Anglican prayerbook, and tried to make it fit the wider vision of their Catholic past. One such place was Brandeston. John Lowes became vicar here in 1596, before he was thirty years old. He stayed until he was eighty, but by then the political and theological landscape had changed dramatically. Lowes allied himself with the Laudian party, which didn't go down so well with most of his parishioners. Once the 1640s came and the Civil War was over, the Commonwealth declared and the Church of England suppressed, these brave men were left high and dry. Ministers like Lowes who considered themselves priests, rather than simply preachers, were increasingly isolated from their flocks and from each other. At Theberton, Ufford and elsewhere they were prosecuted as 'scandalous ministers'; their activities on the Sabbath were scrutinised, their ritualistic behaviour carefully noted and used as evidence against them. At Brandeston, the puritans went one stage further, and under the authority of Matthew Hopkins, the Witchfinder General, Lowes was indicted on a charge of witchcraft. This poor old man, who had overseen the pastoral care of his parish for longer than most of his accusers had been alive, was tortured into insanity. Eventually, he signed a confession that he had employed two imps to sink ships at sea. Taken to Bury St Edmunds, he was one of forty innocent men, women and children hanged or burned there in the autumn of 1646. Brave to the last, he read the suppressed Anglican burial service out as he was taken to the scaffold. It is hard to imagine this in such a peaceful spot today. There is no doubt that Lowes was murdered simply for his Anglican beliefs, and although the Church of England doesn't really believe in such things, it would be nice if he had some official liturgical recognition of his bravery, since he is the nearest thing the Anglicans have to a Suffolk martyr. And it would be nice if the forty martyrs of Bury St Edmunds had some recognition too. Well, as a Catholic, I think so, anyway. 19th century Brandeston Hall stands beside the church; for many centuries, its predecessor on the site was home to the Revett family, but it is now a public school. 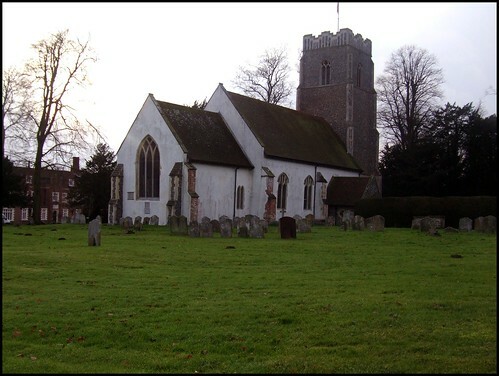 The church has cheery white rendered walls, under a trim 19th century red tiled roof. The most outstanding feature to a visitor is the pair of yew hedges lining the path up to the Victorian north porch, quite unlike any other in Suffolk. The tower was built after a bequest of 1430, and has fine proportions. So much so, in fact, that it is specifically sited in a will of 1487 as the model for nearby Helmingham and Framsden. The chancel advertises itself as even earlier, but in fact it was ruinous by John Lowes' time, and much of what we see is Richard Phipson's work in the 1870s. The interior is very pleasant, with one of those Purbeck marble fonts familiar from this part of Suffolk. The Revetts are all around, in memorials and bequests. The grand Stuart pulpit might very well be that used by John Lowes; but a description of a century later calls it 'old and decaying', so it probably came from somewhere else. There is a fine scattering of medieval glass, including an excellent roundel of St Catherine, and two other panes which must have come from the edges of a larger work, which feature a monk and a donor. My favourite thing of all is the little 16th century glass pane with the pomegranate symbol of Henry VIII's first wife, Katherine of Aragon. The Latin text says Whom God has joined together, let no man put asunder. Henry's divorce of Katherine led inexorably to the rise to power of the puritans, and to the death of John Lowe; as Sam Mortlock wryly observes, historic irony is almost always accidental.